Autodesk® AutoCAD® provides a few commands (by default) capable of performing distribution and alignment functions. These commands are very complex, making the simple task of aligning and distributing something time-consuming and inefficient. Align&Distribute is a plug-in for AutoCAD that provide a set of commands very similar to align and distribute commands present in other graphics software such as CorelDral®, Photoshop®, Inkscape®, and Illustrator®. Through this command you can easily and quickly align or distribute many types of objects with different shapes in the X, Y and Z axis. The single limitation in this TRIAL version is that the command affects only 7 objects per selection. For a larger quantity get the paid version here. For more details about this tool, access http://arsenaltechno.com/en/align-and-distribute/. IMPORTANT: This plugin is not compatible with AutoCAD 2013 or lower. 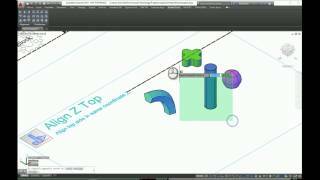 Solve one of the major shortcomings of autocad. This app is easy to use, user friendly and it align and distribute exactly as I want. Great job. O programa trouxe as funcionalidades de alinhamento de grandes softwares ao AutoCAD. É muito fácil de alinhar os elementos, quem utiliza o alinhamento do Corel ou Inkscape está em casa. Muito bem pensado, facilita e muito o trabalho. Parabéns ao desenvolvedor.